Galaxy S9s began shipping out a few days ago, though Sprint customers who ordered their phones via Samsung's official site are having some issues. 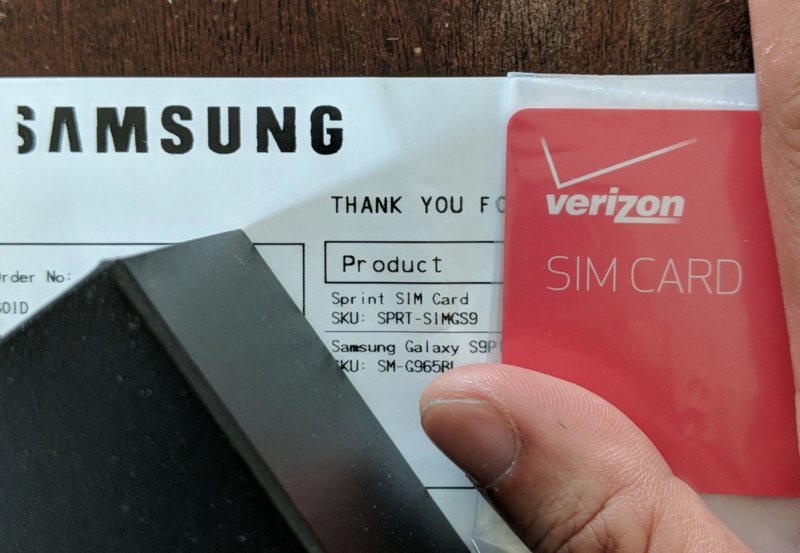 For some reason, Verizon SIM cards are being sent out with Galaxy S9s intended for Sprint, and it's causing quite a bit of confusion. We actually first learned of this by way of Brandon from our own YouTube channel (which you should check out, by the way). As can be plainly seen from his order, he was slated to receive a Sprint SIM card and somehow ended up with a useless-to-him Verizon unit. He's by no means the only one with this issue; many others have chimed in, saying they've had the same thing happen. At least it seems to be constricted to Sprint users getting Verizon SIMs, with no other carrier mixups going on. This wouldn't be a huge deal if the buyers would just be able to get a proper Sprint SIM, but it seems like that's too tall an order to handle. Samsung's online support is backed up and not of much help, even if it is aware of the issue. One Samsung Sales rep even told a customer to "just eat the $30 [that the Sprint SIM will run]." That being said, it looks like some people are paying $10 for one (not $30), and some are getting them for free. Additionally (and this is news to me), Sprint actually has fragmented SIM cards. The Galaxy S9 uses a rather new SIM, meaning that it can actually be somewhat difficult to get ahold of one. Many Sprint stores don't have any of these in stock and are having to order them, though that still means 1-3 business days of not being able to use a shiny new phone. A few have had luck by purchasing a SIM via Best Buy, though others aren't as fortunate. If you're in this predicament, the correct SIM can be found via the information above thanks to /u/halcyoncmdr on r/Sprint. The same user (a Sprint employee) is also encouraging affected customers to PM their IMEIs, as he/she can forward them to Sprint and Samsung to help resolve the issue.